Danny Haynes dismissed as Hibs are comfortably beaten in Perth. St Johnstone secured a top-six finish with a comfortable 2-0 victory over Hibernian that consigned the visitors to finishing a wretched season in the bottom half of the Scottish Premiership. Hibs needed a win to cling to their own dreams of reaching the top six, but a first-half strike from Steven MacLean and an own goal from Ryan McGivern sealed both clubs' fate. A miserable afternoon for the Easter Road outfit was summed up by the dismissal of striker Danny Haynes for an alleged stamp on former Hibs midfielder David Wotherspoon just two minutes after McGivern's 54th-minute own goal. The victory, which leaves St Johnstone seven points ahead of Hibs - who only have two games left before the split, will have acted as a tonic for Saints manager Tommy Wright, who missed the match through ill health. The Northern Irishman was taken to hospital this week with stomach pains and underwent a gallbladder operation on Thursday. The problems facing opposite number Terry Butcher are clear and, despite making six changes to his starting line-up from the team which lost to Partick Thistle seven days previously, it was another 90 minutes to forget. The ramifications of the result appeared all too much for both sides in a tentative opening. It was a mix-up in the St Johnstone defence that almost gifted Hibs the breakthrough after just eight minutes. McGivern's long punt was chased by Paul Heffernan but Saints defender Frazer Wright and keeper Alan Mannus got themselves in a muddle and the former's header was only just tipped away from goal by the keeper. Two minutes later, home midfielder Gary McDonald was culpable as he dithered on the edge of his own box and was caught by a posse of opponents. However, Haynes' shot swept across the goalmouth and wide. 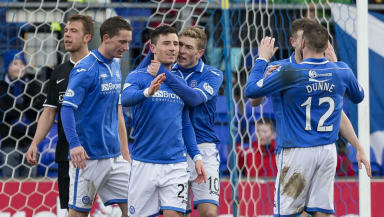 And St Johnstone then took the lead in the 17th minute with their first sustained attack of the match. David Wotherspoon's cross picked out Stevie May and the striker's looping header was touched away by Hibs keeper Sean Murdoch, who blocked MacLean's follow-up effort from a tight angle. But the danger had only been temporarily repelled. Wotherspoon's whipped corner was flapped at by Murdoch, in the team after regular number one Ben Williams' wife went into labour ahead of kick-off, and MacLean got the final touch in a goalmouth scramble. The striker should have got a second 11 minutes later but instead served up an incredible miss. May's chip was fired back across goal by Wotherspoon but MacLean was stretching as he volleyed over from just three yards out. 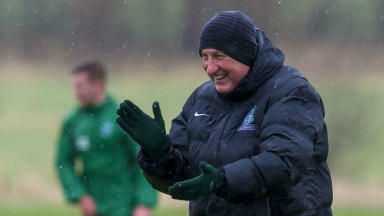 Hibs' lack of resilience in defence was in contrast to St Johnstone, who threw bodies in when required at vital moments. Wright was the man in the right place at the right time in the 30th minute when Haynes knocked dowm Jordon Forster's free-kick to Heffernan and the striker saw his effort blocked. Five minutes from half-time, Murdoch redeemed himself with a magnificent diving save. May's cross was bulleted goalwards by the diving Wotherspoon but the Hibs keeper leapt to his right to turn the header round the post. Hibs knew they needed a massive turnaround in the second half if they were to maintain their top-six dreams, but things went from bad to worse for the Easter Road outfit within moments of the restart. They could have been two behind in the 52nd minute but Murdoch did well to save May's close-range header from a Gary Miller cross. However, the goal was not long in coming as Saints stretched their advantage two minutes later. Michael O'Halloran did the damage with a surging run to the bye-line, but there was a touch of fortune as the striker's cutback was knocked into his own net by the retreating McGivern. Two minutes later and it was all over for Hibs. Haynes connected with Wotherspoon in a jumble of legs on the touchline and referee Steven MacLean reacted by showing the striker a straight red card. 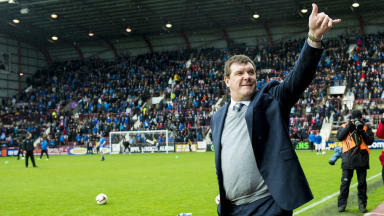 It was then a matter of how many St Johnstone would win by. MacLean headed over in the 63rd minute and six minutes later Murdoch did well to hold Dave Mackay's shot and a May effort. With a ricochet from visiting defender Michael Nelson pinging off the outside of the post, and Murdoch repelling a May shot before Gary MacDonald bundled another effort just wide, it was a surprise that Saints did not triumph by more.